A light and nimble wheelbarrow for passionate gardeners, with quality built in to every aspect. It is UV protected so you can leave the wheelbarrow outside with minimal deterioration. The Supertuff will give decades of faithful service, making this a garden connoisseur’s family heirloom. The Supertuff has a plastic tray that is low and wide with a flat base to be a help in the garden, whether it be for mountains of garden waste or carrying tools and plants. Made from tough PE plastic to stay ductile and resilient. Able to handle climatic extremes. Impact resistance factor of 20. Fully hot-dip galvanised components and bolts for long life. Strong plastic eight inch rim. Good quality butyl rubber inner tube, so the tyre stays hard. Large free-running precision-sealed ball bearings. 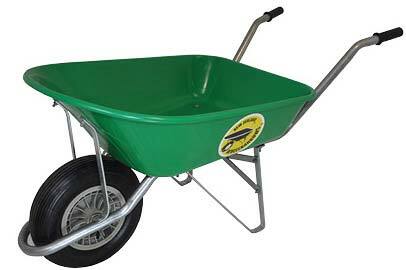 "The Supertuff Wheelbarrow offers outstanding value for the serious gardener. It will give you pleasure for years."